Chi Chi Starlite Room C1960 Palm Canyon Drive In Palm Springs is a painting by Melvin Hale ArtistLA which was uploaded on October 6th, 2010. One of our most popular subjects, the Chi Chi club at 217 N. Palm Canyon Drive in Palm Springs California. In addition to the listed stars, many Hollywood celebs made the club a popular hangout. Where Sinatra met Eva Gardner, etc. This is a digital paintng from a vintage sepia lithographs. The club is torn down. Melvin Hale (ArtistLA), an award-winning digital artist, uses vintage black and white photos and real photo postcards (RPPCs) to create realistic color digital paintings that bring the past alive. It's called Digital Realism. 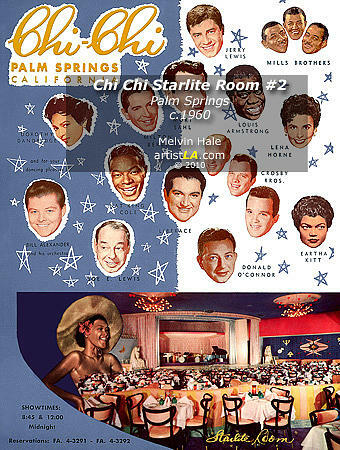 There are no comments for Chi Chi Starlite Room C1960 Palm Canyon Drive In Palm Springs . Click here to post the first comment.